Purcell & Woodcock is a luxury lifestyle brand, offering affordable products to families that desire luxury for everyday living. 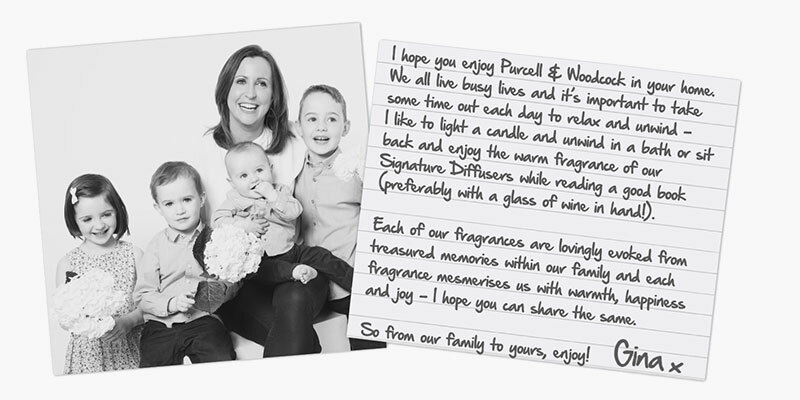 Founded by Gina Cassidy, a busy mum of four small children, the Purcell & Woodcock brand is built on family values. The brand heritage is close to Gina’s heart, the Woodcock family is her family of origin from Dublin and the Purcell family, her husband’s family from Limerick. Gina’s vision was clear from the start, Purcell & Woodcock would offer high quality, useable luxury products, at accessible prices. The products are designed in Ireland and focus on quality, beauty and usability. Each product pairs beautiful fragrances and signature packaging, and we aim to delight, enhance and enrich customer’s homes and lifestyles with every product.